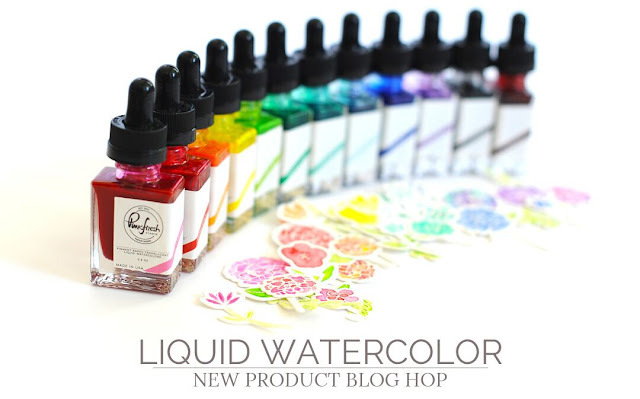 Herzlich willkommen zum Pinkfresh Studio Liquid Watercolor Blog Hop! Ich freue mich sehr, an diesem Event teilzunehmen und euch die neuen flüssigen Wasserfarben von Pinkfresh Studio vorzustellen. Die Farben befinden sich in kleinen Glasflaschen und sind mit einer Pipette, die am Verschluss befestigt ist, sehr gut dosierbar. Die Intensität der Farben ist wunderbar, zudem sind sie sehr leicht einzusetzen. Ich habe mich auf meiner Scrapbooking Seite für Wasserfarben-Highlights entschieden. Durch die Pipette kann man sehr schnell und sauber Farbkleckse setzen. Außerdem habe ich die Aquarellfarbe auf kleine Papierstücke aufgetragen, z. 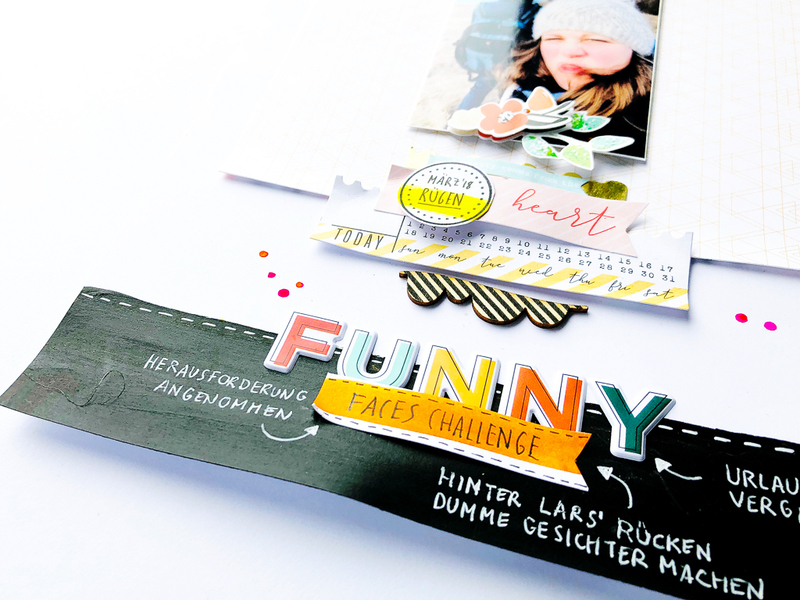 B. im Titel unten oder im gestempelten Kreis im Mittelteil des Scrapbooking Layouts. Mit einem wasserfesten Stift kann man sowohl auf der trockenen Farbe schreiben, als auch zuerst schreiben und dann die Farbe auftragen. Für die Gestaltung des unteren Drittels habe ich meine alte Tafelfarbe wieder ausgegraben. Oder eher gesagt, habe ich diese letztens wiedergefunden und mit Bedauern festgestellt, dass ich sie kaum nutze. Mir gefällt der Tafel-Look und das intensive Schwarz. Mit einem weißen Gelstift habe ich die kleinen Journaling-Spots erstellt. 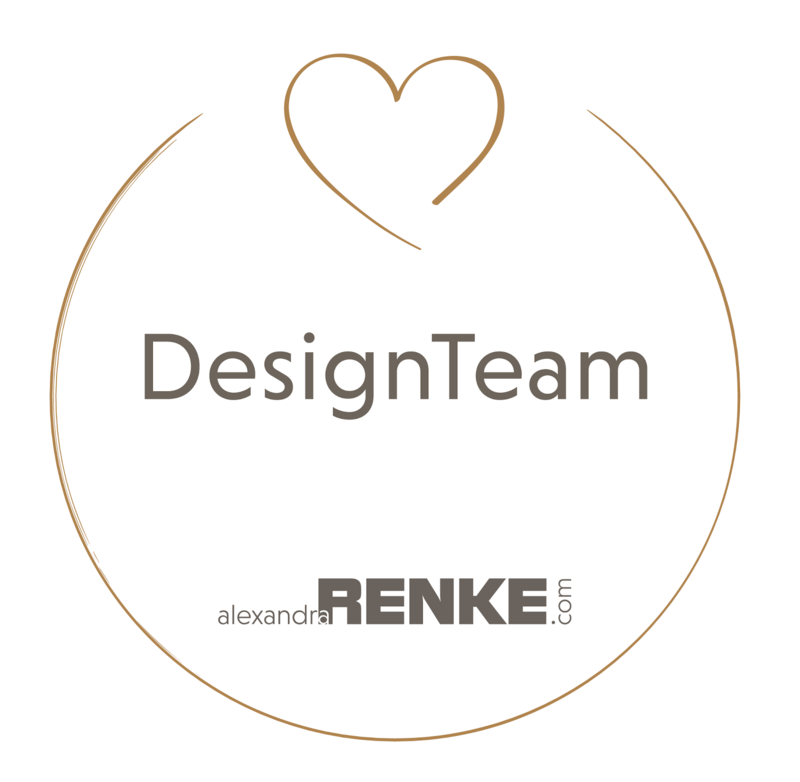 Die verwendeten Papiere, Embellishments und Stempel sind aus der 'Let Your Heart Decide' Kollektion von Pinkfresh Studio. Definitiv eine meiner Favoriten. Neben zahlreichen Projekten auf den teilnehmenden Blogs, findet ihr unter dem Hashtag #pinkfreshstudio weitere Inspirationen auf Instagram. 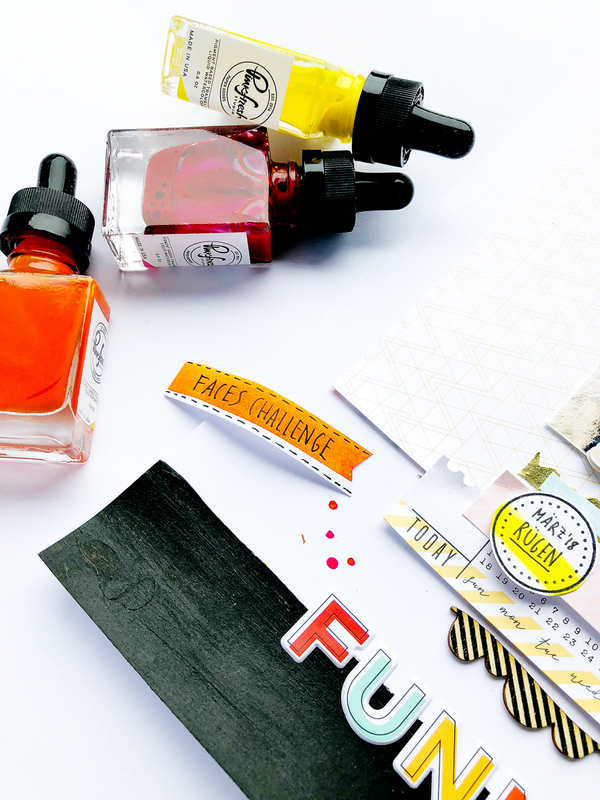 Das Schöne am Pinkfresh Studio Liquid Watercolor Blog Hop ist, dass ihr die Möglichkeit habt, etwas zu gewinnen. Auf dem Pinkfresh Studio Blog habt ihr die Chance, 1 Set der Liquid Watercolors zu gewinnen sowie 2 Gutschein je 50 Euro. Darüber hinaus verlosen die teilnehmenden Blogs jeweils einen Gutschein im Wert von 25 Euro. Die GewinnerInnen werden zufällig aus den Kommentaren auf den entsprechenden Blogs ausgewählt und am 10. Juni 2018 auf der Pinkfresh Studio Giveaway Seite bekannt gegeben. Bitte beachtet, dass ihr die Giveaway Seite eigenständig verfolgen und euren Preis innerhalb von 2 Wochen nach Bekanntgabe in Anspruch nehmen müsst. Der Rechtsweg ist ausgeschlossen. Nun viel Spaß beim Hüpfen - die Liste der Teilnehmerinnen findet ihr direkt im Anschluss. Ich drücke euch die Daumen! I love the colors one your page. So awesome!! Those watercolors look like a lot of fun! I love how vibrant the cokors are!! Beautiful! The colors of these new watercolors are gorgeous. They look very bright and cheerful. Lovely faces! Great job and very nice colors! Ha! What a cute layout! Love these watercolors! Cute page. Love the vibrant colors. 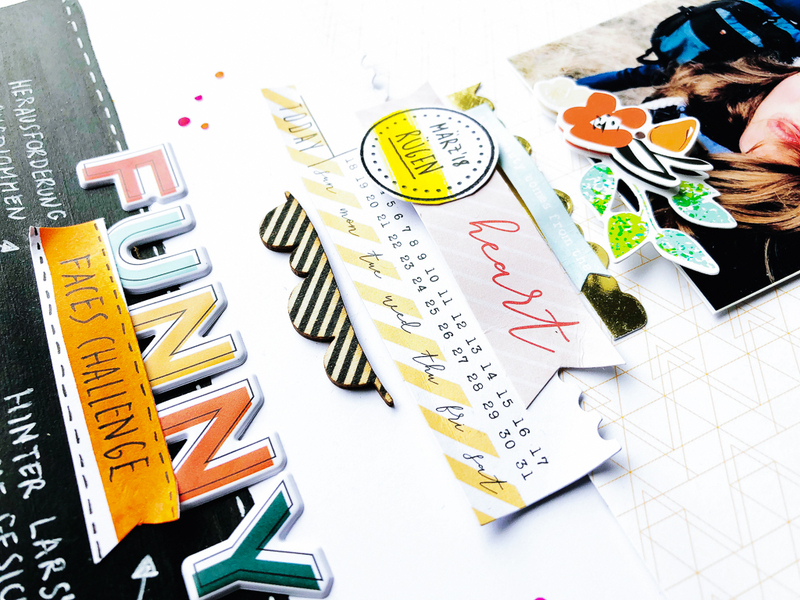 So clever, this is a gorgeous layout Janna! What a fun layout and fun photo! These paints look like so much fun to use. Love the idea of using the watercolors to accent your embellishments. Danke! The colors work well for intense or subtle colors. I'm so excited to get them! Nice layout and great watercolors! TFS! really pretty layout!!! love the colors!!! Amazing layout, love the bright colors! Love the layout and the fun ways you used the watercolors. So pretty and bright. Gorgeous job. I just love your layout..so modern ,graphic and lots of white space ensures focus on the colors ! Love this happy layout. The new colors are really gorgeous! Great layout page using the liquid watercolors! Great way to use the watercolors! Love the colors of your Funny Faces Challenge page! Thanks for the inspiration! Wonderful layout and perfect color combo. gorgeous, vibrant colors...who could ask for more? This is probably how I would use them too. A fabulous layout Janna, the vivid colours really pop on your words. Very nice job. I like your funny faces challenge and how you colored in around the page layout. A great idea and so fun to look at. Looks like a great trip and adventure you had there. Thank you for sharing your water coloring with us. Love your layout - such a cute picture! Very fun look! Thank you for sharing with us! Fabulous layout!! Love the look of these watercolors!! Great layout and amazing colors! Great page, love your design. Very creative. Thanks for the closeup looks at all those pretty colors! Janna, what a cute photo and a great layout! Very nice layout love your colors choices!!! Thanks for sharing!!! Gorgeous layout! Amazing vibrancy in the wonderful colors. Cute photo and I like the colorful title. Pretty new products, so much fun! Love your layout. The bright colors look fabulous. Such a striking design, so bold and impressive! What a fun page! Love the bright colors. Very nice! Colors are awesome! So fun, love the color choices! Great scrapbook layout! The watercolors were perfect for adding pops of vibrant color to your page. Love the bright colors!! So summery. Stunning layout! Love the bold colors and offset lettering! Great layout and use of the liquid water colours! Love your layout - perfect touch with the watercolours! What a bright and fun page Janna. Love the cheerful and fresh colors! Great way of using them to highlight words. These colors are so vibrant! Love your page! Love your page layouts! Nice! So beautiful...I want them all. Awesome page! And great to know that you can write on the dried paint! Fabulous layout! I really like how you used the watercolors to accent the page. the colors of the watercolor are so bright and vivid. I love all of the colors!!!! The colors are so vivid that it makes your elements just pop out on the page. Good job. Love your washes of color. Great layout! Fun layout and wonderful, cheerful watercolors ! 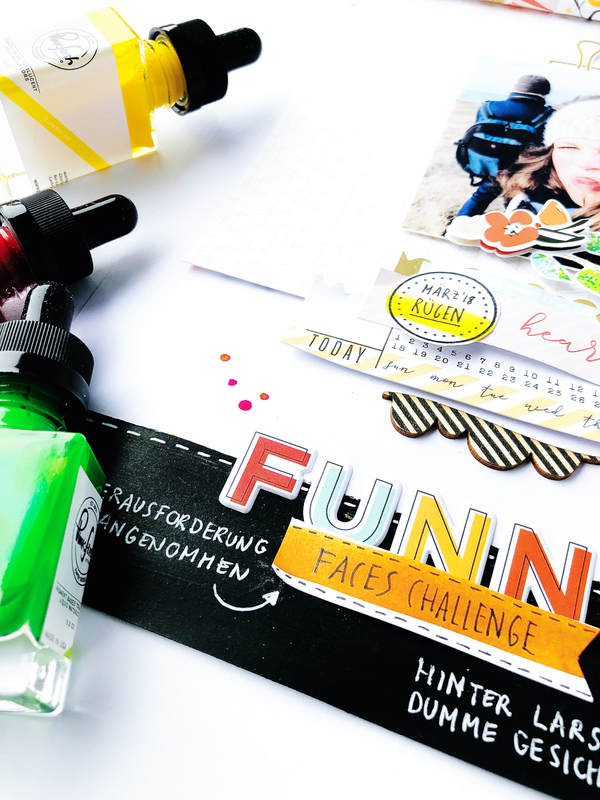 Danke schon for sharing your funny face layout with such fun colors. 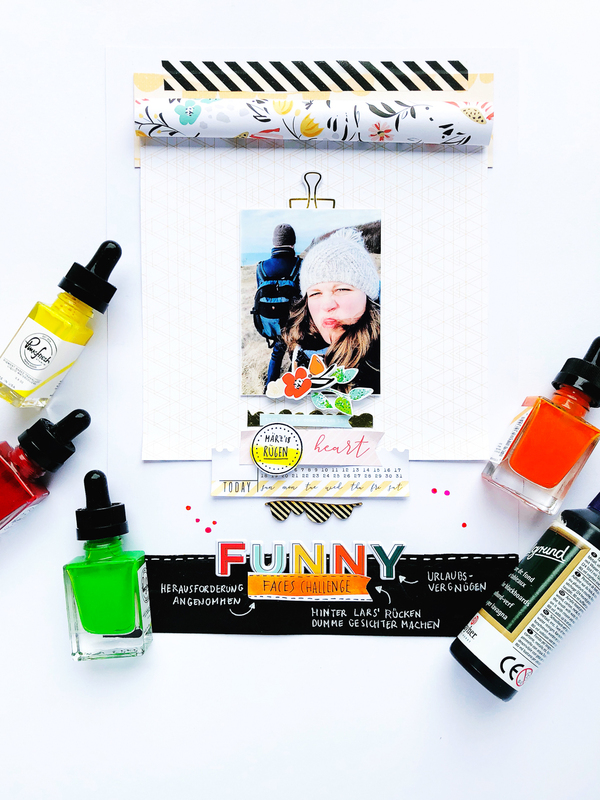 These bright watercolors are the perfect accent to go with the funny face challenge; you used them so nicely! I love those pops of color all around. Thanks for sharing with us! Your layout is so fun! The watercolors make your page so nice and bright. Great layout! Love the intense brightness of the fun watercolors! I love the pops of colour in the layout. Gorgeous! Beautiful layout - love the colors you used and how you showcased the watercolors! Sweet layout with these new colours. Love your layouts and all the watercolors!! Wonderful layout and the colors are so bright and beautiful! That’s a fun and happy layout ! So cute! Love the funny face! How fun - love the colors. Great layout, looks like you were having fun. Easy way to add vibrant color. This is a really cool layout! Can't wait to try the colors! Those are beautiful watercolours. I hope I get to try them. Love the way the title pops on the layout! Wow, what an excellent layout. Fun page! Love those pretty colors! Love how you used the watercolours Janna! They look awesome on your gorgeous page! Beautiful project! And the watercolors - so bright and vibrant, and easy to use! Great layout! Love those graphic pops of blacka nd also that rolled paper! Fun layout design! Great, bold colors!